A heartfelt thanks from us both to you and Dawn for making our day so special. The ceremony was everything we could have wished for, so beautifully conducted and so very intimate and personal to us. I just wanted to say a massive thank you for making our day so special. I hadn't had time the week before the wedding to meet up with Sue who conducted our ceremony so I was especially nervous when I arrived. I was greeted by Sue straight away and she was so lovely to everyone! Her calm voice and lovely nature had such a big impact on our ceremony and made it especially beautiful! 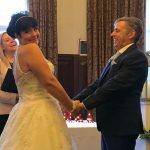 so a massive thank you from me and my now husband! Jonathan and I just wanted to send a quick email to say thank you for your time on our wedding day back in December. We had the most perfect day, we recently received our wedding video back and I actually got take the time to listen to your words and the vows and actually appreciate it, it all flew by on the day so it was really lovely to see it all back. Family members and friends have also commented on how lovely the ceremony was. Thank you again for your time and professionalism on the day, you really contributed to making it so special for us. Just thought I’d send this pic before we go on honeymoon to say a massive thank you to you for such a very beautiful ceremony. I think this is such a perfect moment captured by one of our friends! We both think Cheshire East are a fabulous Registrar service & of course Rebecca was amazing. A couple at our wedding had their ceremony with you in 2016 also commented on what a wonderful ceremony you performed so please pass this on to your colleagues & our thanks again. We just wanted to say thank you again... it was an amazing day and we’re still on cloud 9! Everyone has commented just how personal and thoughtful you made the ceremony. You kept us at ease throughout and clearly your lovely nature shone through to all our guests! 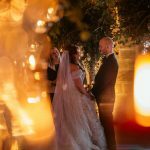 We have been told by more than a few people that it was the best ceremony they had ever been to and this was, no doubt, completely down to you! Thought you might like this picture as we think it sums up just how fantastic you were!